POSTED February 14, 2019 11:55 a.m.
LANCASTER — It wasn’t really even close. 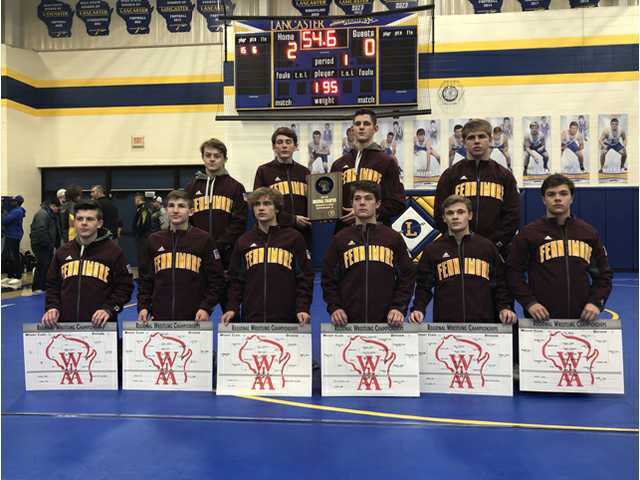 Senior Maguire Fitzgerald and junior Luke Blair returned to the lineup after missing the conference tournament, and the Fennimore wrestling team cruised to the regional title at Saturday’s WIAA Division 3 Lancaster Regional. The Golden Eagles crowned six champions, had 10 sectional qualifiers and racked up 274 points to earn a berth in Wednesday’s WIAA D3 Fennimore Team Sectional, that was pushed back a day due to Monday night’s snow storm. Sixth-ranked Lancaster finished a distance second with 220.5 points, while seventh-ranked Mineral Point finished thid with 200.5 points. Blair (113 pounds) and Fitzgerald (160), along with junior Mason Lull (120), junior Aidan Nutter (132), senior Trevor Wanek (138) and junior Will Ahnen (170) each won individual regional titles. Sophomore Brody Lee (106, 25–10), junior Alex Birchman (126, 27–11), junior Aaron Ragels (195, 31–9) and senior Brayden Leffler (220, 26–10) each finished second to qualify for sectionals. The top two regional finishers in each weight class advanced to Saturday’s WIAA Division 3 Individual Sectional. The top three finishers in each weight class at sectionals will advance to next week’s WIAA Individual State Championships at the Kohl Center in Madison. Fitzgerald (32–5) was predictable rusty but scored a 3–2 decision over Mineral Point’s Mason Hughes in the 160-pound final. Blair (28–7), who has been battling a knee injury all year, won the 113-pound title with a 7–5 decision over Lancaster’s Carter Lull. Lull (30–12) won the 120-pound title with a second-period pin over Lancaster’s Caleb Lucey. Nutter (32–7) defeated Mineral Point’s Caden Carey 5–2 in the 132-pound championship. Wanek (25–13) defeated top-seeded Darlington/Black Hawk’s Kolbe Ubersox 6–3 in the 138-pound final. Ahnen (35–9) scored a 7–1 decision over Darlington/Black Hawk’s Carson Lobdell in the 170-pound title match. “Will is wrestling well,” said Steldt. “His technique was solid, but his finishing of matches was lacking. The main attack is getting better though and that is what is important. He is doing a great job attacking low heel shots and misdirections. Birchman broke his nose Saturday, but finished second after pushing Mineral Point’s Danny Pittz to the limit in a 4–2 championship loss. Fennimore also had a couple of tough near misses on Saturday. Junior Logan Klaas (23–10) finished third at 182 pounds as did senior Dylan Kehoe (10–11) at 285 pounds. Juniors Nick Blaschke (16–22) and Mason Miles (16–10), who was wrestling with a bum shoulder, each finished fourth at 145 and 152 respectively. “Logan Klaas was tough to swallow,” said Steldt. “It hurt to not see this kid move on. He definitely is state qualifier material, but was a causality of the tough regionals we are in. We really thought Logan would get a wrestle back after being beat by Klein from Lancaster. It would not happen though. Beinborn from Boscobel had some last minutes heroics verses Klein in the championship match, which destroyed any chance Logan would have at a wrestle back and a chance to move on. Team scores — 1.Fennimore 274, 2.Lancaster 220.5, 3.Mineral Point 200.5, 4.Iowa–Grant/Highland 133, 5.Darlington/Black Hawk 132, 6.Boscobel 93, 7.River Ridge/Cassville 49. 106 — Brody Lee (25-10) placed 2nd and scored 20.0 team points. 113 — Luke Blair (28-7) placed 1st and scored 24.0 team points. 120 — Mason Lull (30-12) placed 1st and scored 26.0 team points. 126 — Alex Birchman (27-11) placed 2nd and scored 20.0 team points. 132 — Aidan Nutter (32-7) placed 1st and scored 24.0 team points. 138 — Trevor Wanek (25-13) placed 1st and scored 24.0 team points. 145 — Nick Blaschke (16-22) placed 4th and scored 9.0 team points. 152 — Mason Miles (16-10) placed 4th and scored 11.0 team points. 160 — Maguire Fitzgerald (32-5) placed 1st and scored 22.0 team points. 170 — Will Ahnen (35-9) placed 1st and scored 22.0 team points. 182 — Logan Klaas (23-10) placed 3rd and scored 16.0 team points. 195 — Aaron Ragels (31-9) placed 2nd and scored 22.0 team points. 220 — Brayden Leffler (26-10) placed 2nd and scored 18.0 team points. 285 — Dylan Kehoe (10-11) placed 3rd and scored 16.0 team points.